A gym! Blessed Jeebus, a gym! Mind you, in this sweltering humidity, I could only manage one charge up the hotel stairs and a mere 10 minutes on the treadmill. But, Shiva be praised, a gym! Got back to my room to shower in the standard Indian curtain-free affair (thus getting the entire bathroom wet) and turned on the TV. The first show was a standard Hindu spiritual. But get this…. its theme music? The theme from the movie “Terminator”. I kid thee not. Apparently Krishna is a cyborg from the future. Teenage Headley… Who’s A Horni Man? This was, of course, fine with me. But as I reached for a plate, he snatched it first, then led me through the buffet line. “Toast, sir?” I nodded, and he toasted and buttered some bread. “Cereal, sir?” I nodded again, and he decanted some corn flakes into a bowl and added milk. When I reached for a coffee cup, he snatched it from my hand and poured the coffee and added the milk. I’d hate to see how these folks define a “self-service” toilet experience. India –well, Mumbai, at least– is FIFA obsessed. Pretty much every news story has something to do with football. This morning alone, I counted six TV segments on that ridiculous match-predicting octopus, Paul. Apparently there were three murders in New Delhi last night. (Yes, I have an alibi.) It’s odd that this would make the news, given the city’s official size of 13 million and likely size of 20 million. Surely a lot more than three murders occur daily? There’s gripping wall-to-wall coverage of… wait for it… a Pakistani pilot who was allowed to visit Thiruvananthapuram in Kerala. Yes, that’s it. He was allowed to get off the plane, walk around, then go home. Apparently that’s newsworthy. A headline today proclaimed that “Headley May Be Brought to India!” Really? Indians care about that incredibly lame Canadian pop band? Ahhh, they’re talking about DAVID Headley, a Pakistani-American terror suspect! Maharashtran news has been all over a controversial book called “Shivaji: Hindu King in Islamic India.” Some historians consider parts of the book to be “offensive”, due to some seemingly derogatory depictions of the icon Shivaji (after whom the Mumbai airport is named); and in 2004 the Maharashtran government actually banned the book! And on Friday the Supreme Court officially, thankfully, lifted the ban. Regardless of the supposedly offensive nature of its content, no liberal democracy with any aspirations to global legitimacy should ever engage in official book banning. That way leads disaster! Since the onset of monsoon season this year, there have been 20 confirmed cases of H1N1, with two deaths. Swine flu is old news in the West, but the season is still underway here. Okay, I’m off for a walk to Horniman Circle. That’s right. You read that correctly. I was clearly always meant to visit this place. Crawled home at 4:AM last night, scaring th be-Jeebus out of the napping guard and the napping front desk worker. It was actually kind of cute, the sight of a burly working class night watchman, bedecked in brown uniform, napping on the couch alongside the middle class young receptionist, dressed in his smart shirt and tie. No, they weren’t cuddling. Or if they were, I’m not telling. Then I slept through my gym time, the alarm, my free breakfast and lunch time. I was only awakened by the phone call from the front desk at 2pm, informing me that my friend Kulsum had arrived to take me to her parents’ home for a late lunch. Kulsum couln’t pick me up directly from my hotel because there was some sort of film shoot or photography shoot right outside, which barred all traffic in the vicinity of my hotel. 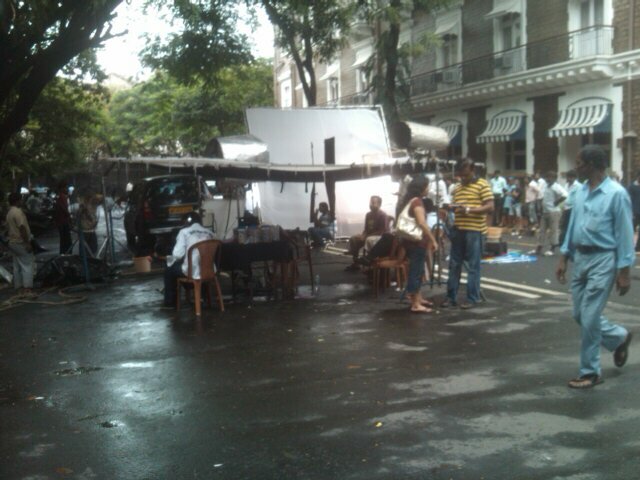 This is Bollywood, after all, where everyone is filming something all the time. Above is a quick pic of the scene. Clearly it’s not big enough to be an actual film set, so it’s probably something small and local; maybe a TV or print ad. Now, Some may wonder why I’ve spent so much time indoors, doing nothing more than eating, drinking and chatting. But in my experience one learns a lot more about a place simply by interacting with its residents, rather than taking in the traditional tourist sights. Last night’s ethanol-fueled evening in the home of trendy young Bombay professionals was highly instructional. For example, I learned that the derogatory term for an Indian who does not speak English is “Vern”, as in “vernacular”. That tidbit alone was worth the price of the flight! Today’s late lunch with the elder set of Bombay’s educated class was equally as instructive. I particularly loved a photograph in a coffee table book showing my friend’s dashing father at the Bombay racetrack. Despite being taken recently, the photo elicits visions of the cool, 1960s Bombay, a place frequented by playboys, libertines, the fashion conscious and those who take the biggest bites out of life. Western Orientalists often try to force India into their expectation of a land of fate and spiritual depth. I have always eschewed such temptations. It is curious, however, the number of people here who have asked me about the extent of my religious beliefs, supposedly in contrast to the truth of my life’s dedication to Western science. My final stop in India will be a very brief (and complicated) visit to a small town in Andrah Pradesh called Kakinada, for an important research meeting with a potential partner in opthalmological care for the desperately poor. Very few have ever heard of Kakinada. A couple of nights ago, all were stunned to discover that one of the magazine editors I was drinking with is in fact from Kakinada. She was overwhelmed by this coincidence, as few people in Bombay had ever heard of her town, and suggested that it was Fate reinforcing the importance of my visit to the place. Who knows? India has always presented me with coincidences. My last visit to Bombay included an evening out with a young lady who turned out to be the old friend of another friend in Toronto! Out of more than 20 million options, I chose perhaps the only person I had some kind of tenuous, but unknown, personal connection with. I was earlier chastised for calling Bombay by its new name, Mumbai. I cant keep track anymore of what’s appropriate. It’s Sunday night. I have a lot of work to do. So Ive just made a decision to stay in, ostensibly to watch the World Cup finale (because y’all know what a big sports fan I am) and to try to write some papers. I just ordered an overpriced Indian meal via room service and am now enjoying a very cold and very tall Kingfisher beer. Room service in India always rocks. It’s going to be a good night, and possibly even productive. Some are probably wondering why/how I will be watching World Cup soccer after my outspoken views about the silliness of professional sports. My criticisms persist. Remember, it’s not sports I object to, it’s the tendency to associate nationalism with sports; I have no problem with watching a game because one enjoys the athleticism and tension of a match. Having said that, it’s a little easier to deal with football (soccer), since my country (Canada) isn’t much involved. So the nationalism isn’t in my face. Instead, it’s sort of interesting watching the world go nuts over it. And, in fact, it’s sort of cool how the world has come together to celebrate the World Cup. (It’s not so cool watching the over-the-top nationalism, but that’s a losing proposition for me). Soccer is special in the world of sports, however, given that it’s the domain of the underprivileged. Any poor kid can kick a ball. Thus, any poor country can hope to field a championship team. Sports in this context has a social role that is more defensible than in, say, Olympic hockey. For me, it also helps that I’m in another country. It’s been anthropologically fascinating watching India’s obsession with the tournament, given that there is no Indian team represented. This is indicative of Indians’ love for the game, and not for its nationalist implications. I can get behind that sort of purist sentiment. Guess what? My belly filled with curry and beer, I slept right through the “big game”! Is anyone surprised. There was no rioting in the streets, so I assume everything happened in an orderly fashion. Actually, I don’t know, since my hotel room has no windows. The city might be in shambles right now. Speaking of which, one of the more ominous sights is the frequent police-sponsored street sign imploring residents not to handle suspicious packages, given this city’s relationship with terrorism. During my initial walk through Bombay this visit, I of course got lost. Then I realized that I was actually in the same neighbourhood where I’d stayed last time I visited this city, bakc in 2006. I took refuge from the heat in the Jehangir Art Gallery, which had an exhibit on printmaking. The quality of the art here, both modern and ancient, puts to shame much of what I see in Canada. Sorry, it’s true. I guess when you have a billion people competing, you’re bound to have some extraordinary talent emerge. The last time I was at the Jehangir I was surprised to see a charcoal drawing of what was a spitting image of one of my ex-girlfriends. She had once lived in India, so maybe she was the model? Re-emerging onto the street, I was stopped by a boy on a bicycle who handed me a crumpled business card for “Reliance Paper Products”. I examined it, handed it back to him, ne frowned and pedalled off. Perhaps he was actually trying to sell me drugs? I’d rather be perceived as a stoner than as someone in dire need of paper products. I then walked past the David Sassoon Library, a landmark in Bombay. (Sassoon had been prominent Bombay Jew in the 19th century.) On my first visit 4 years ago, the Library was a marvelous and rich nook of eruditeness, with a delightful garden that featured evening violin concertos and the occasional book reading. I’d hoped to schedule my own reading there, but no one had seemed interested. This visit, the Library is in disrepair. I hope it’s being maintained and restored, and not just neglected. It would be a shame. Then, as I stumbled back to my deliciously huge and cool hotel room, I saw the most frightening sight: a fellow zipping by on a scooter, the faceplate on his helmet opened to reveal a certain grinning mug. My grinning mug. That’s right: I had come face-t0-face with my doppleganger. He’s been here in Bombay all these years, living my parallel life. He was gone before I could confront him. What should I have done? Should I have hurled myself onto the bike, wrap myself around his neck and choke the life from his mocking body? There can only be one Dr Wat, as well know. There can only be one. Cyborg Krishna would not be pleased. PS, my latest article in India Currents Magazine is here.